In spring 2019, the UC Berkeley School of Public Health will launch the Gilead Fellowship for the Advancement of Global Public Health. The new capacity-building program will provide support for five international fellows from developing countries, who will train in critical areas for global health, including infectious diseases, vaccinology, and epidemiology. The new initiative is made possible thanks to the generous support from Gilead Sciences, Inc. and will be run by the School’s Center for Global Public Health. The Gilead Fellows will take on coursework for a two-year MPH degree at SPH with a concentration in Global Health. The application for the Gilead Fellowship for the Advancement of Global Public Health will open in fall 2018 to applicants from institutions in low- and middle-income countries (LMICs) from four regions: Africa, Asia, Eastern Europe, and Latin America. The pilot effort will be offered as a hybrid training program where during year one, Gilead Fellows will participate in the School’s online MPH program from their home countries, taking online classes such as research methods, biostatistics, epidemiology, and the foundations of global public health. During the second year, the fellows will come to the United States for a full-time summer internship/field placement in the Bay Area, followed by two semesters of in-person coursework on the Berkeley campus. Bringing their own data sets and research interests, fellows will work alongside Berkeley faculty to address the myriad health challenges facing their country, from epidemics such as HIV/AIDS to other infectious diseases such as Tuberculosis and Hepatitis B and C.
A highlight of the Gilead Fellowship program will be the series of programming and field trips to an array of partner organizations in the Bay Area, community building activities, skills-building workshops, and mentoring and networking events throughout the year in Berkeley. This will foster knowledge exchange and local-global collaboration building, and will give opportunities for the global scholars to learn from Bay Area-based industry and sectors engaged in advancing global health. 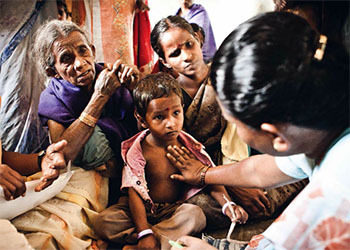 The new public-private partnership joins other existing global health-focused fellowship programs at UC Berkeley, including the Morris Fellowship for the Advancement of Public Health in India, the Global Health Equity Scholars Fellowships, the Minority Health/Global Health Disparities Research Fellowships, and the Center for Global Public Health Research Fellowship.